1 of 5 Heat oven to 375 degrees F. Melt 1 tablespoon of the butter in a large nonstick skillet over medium-high heat. Add onion, peppers and garlic and cook 7 minutes, until softened. Stir in shrimp; remove from heat and let cool slightly. 2 of 5 In a small saucepan, melt the remaining 2 tablespoons butter over medium heat. Sprinkle with flour and whisk until smooth. Whisk in fat-free half-and-half and continue to cook over medium-high heat until thickened, about 5 minutes. Stir in enchilada sauce, whisking continuously until blended. 3 of 5 Remove sauce from heat, and stir 3/4 cup of the sauce and 1/4 cup of the shredded cheese into the shrimp mixture. 4 of 5 Coat a 13 x 9 x 2-inch baking dish with nonstick cooking spray. Spoon 1/3 cup shrimp mixture down center of one tortilla. Roll tightly to enclose filling, then transfer to prepared dish. Repeat with remaining tortillas and filling. 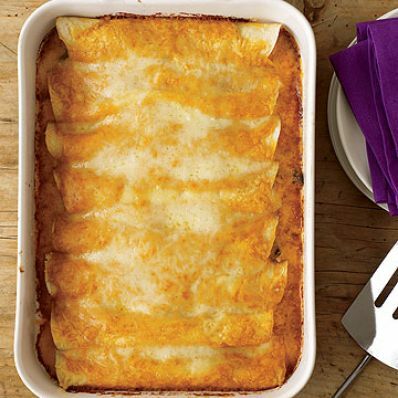 Pour remaining sauce over enchiladas, spreading to edges, then top with remaining 3/4 cup shredded cheese. 5 of 5 Bake at 375 degrees F for 20 minutes, until cheese is melted and sauce is bubbly. Cool slightly before serving. Per Serving: 219 kcal cal., 549 mg sodium, 2 g fiber, 4 g sat. fat, 31 mg chol., 8 g Fat, total, 24 g carb., 14 g pro.